"My name is M and I'm a furry"
This post is based on a comment I left in a friend's LJ. I decided to post an expanded version over here, because I don't think I've ever addressed my evolution as a furry. When I was a little girl I liked to run around and pretend to be a horse. I did that little kid "gallop" running thing everywhere I went, much to the dismay of my parents (not to mention my gym teachers - I did it in gym class too because by that time I could run faster like that than the other way.) The other little kids thought I was a freak but I didn't care. But eventually I gave in to all the pressure to run like I was supposed to and I stopped galloping. Years later the guy I was (then) married to found a photo of ponygirls pulling a cart and showed it to me, commenting that he thought it was hot. I was amazed - you mean, adults get to play pony?! Ooh. I had to try it again! Turns out I still enjoyed running through fields of little daisies, whinnying, and generally ponying around - and in gorgeous white leather tack, no less. A couple of years after that, my boyfriend and I came up with these goofy monster characters (the kind of monsters that little kids pretend to be - you know, jumping out at you going "RAA!") We made monster costumes that were really gestural - cool monster heads based on thrifted bike helmets, monster fur trim on our playa shorts, funky fur glued to our boots. They were a lot of fun to run around in, and we did a lot of RAAing. A few months after that was my first FC. I came with my monster costumes and had a great time running around being a monster in them. I was overjoyed by a compliment from master costumer/mascot designer Mr Dinosaur on my silly little open face monsters! I even managed to RAA my way into some extra cookies from the front desk. Heh heh heh. After my first furcon, I came home wanting to be a bunny. So I made bunny suits (also open face) for me and my boyfriend. We helped organize Billion Bunny Barhops, and of course attended Bunny Jam. Fun fun! So, pretending to be an animal came naturally to me. From all of this, I started to discover how different it is to be each different kind of animal, and began to explore the natures of various creatures. Ninja Kitty is also the first really anthropomorphic character I've ever done - since she wears clothes and runs around doing human type stuff, being a ninja and all. My previous ones were all just straight up animals (although since I do talk as Bouncy Bunny, maybe I should draw the line there.) In any case, I see this as being influenced by the greater furry community - both the increased anthropomorphism, and the playful use of the balaclava as a costume element. Not sure what comment in whose journal this is but it sounds like they dont like the idea of furries in general. Still you are cool no matter if you were furry or not so really it shouldnt matter. Nice to see a bit of insight into your furryness though. Naw. You're reading into the "Oh no" thing at the beginning, which I added (with humorous intent) when I expanded it. The comment was more the stuff towards the end, about being different animals, and was part of an overall discussion among furries. Oh I happened to see the fox hat you had and Im glad you are selling those. Nice work. i used to do the pony thing as a kid myself, complete with towel or strands of pampas grass shoved into the back of my pants as a tail. ^_^ i also used to draw anthro characters, mostly because i learned to draw animals long before i figured out drawing people. I bet you were an adorable pony! I have pretended I was an animal forever though I never called myself a furry. Its more in spirit in a dominant-submissive but silly way with my lovers. With my ex boyfriend I would always ask "what am I?" and he would say " you're my little animal". It felt really warm and loving and it allowed me to get out of my very neurotic and human brain. I think its a natural extension of my love for real animals and a way I can express my emotion in a safe and playful way. You and Jovino are the most stylin' furries I've encountered though. I would definitely wear one of those hats, maybe I'll order one, If I were an animal I would most definitely be a red fox and I've known this for my whole life! Red fox, huh? Oh, do we have the hat for you! 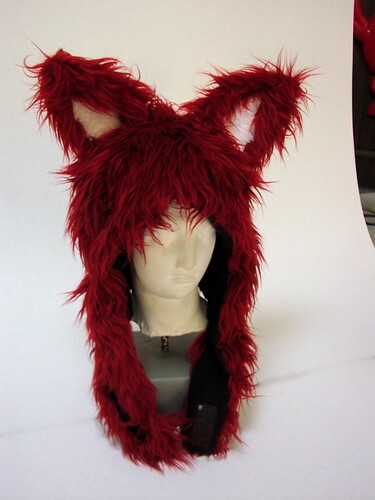 It's not up on the site yet, but yes, we have an adorable red fox hat in faux fur! It's in the prototype phase, but ready for production. We'll be introducing it hopefully within a week over at bunnywarez.com. The sides have velcro on them that wrap around the chin. It's like wearing a fur hoodie. There's also a little stash pocket that can accommodate an iPod Nono should you be one of the millions. Fur styles and ears will be options available once we get it into production. I would like to have a Ninja Kitty for Four Crawl this weekend. Is it possible to get one? I will pay $$$$ for it and be a living advertisement for the power of Bunny Warez. Yes! Is possible... at least, I think so. Our serger is in the shop right now, but we should have it back in time. Since this needs to fit over your fabulous dready-dreads, I need to have you measure around your head (including the dreads) from your forehead (just above your eyebrows) to around the back (base of the skull) - so a slight angle - and email that measurement to bunny-at-bunnywarez (dotcom). Or, I can just bring a tape measure to BaGG. As long as the serger shop comes through, we'll have it for you. You can also try on my ninja kitty hat at bagg, and if it fits well enough you can just borrow it, if the serger doesn't come back in time. It should, though. Yes! I do happy Snoopy dance all over room. Tomorrow when I am home I will make the measurement and bring to BaGG. If the serger is still sick, Iz ok. I still want Ninja Kitty anyway and will wait! You're such a fun person! The fandom will be a better place with shiney happy people like you bouncing around in suits. Awww, thanks! I have to admit, I'm having an absolute blast. Yay M! I'm really glad you posted this- thanks for sharing your furry-ness with us! I really enjoy hearing about how others work their world around this stuff. I'm also a creature that does lots of different animals, characters, and personas depending on my mood - more of a playful shapeshifter. Most of the other furries I've come across generally seem pretty solidly identified as one animal, which is so not me. I just love any excuse to wear a costume, play a role, etc. Your process around this sounds more similar to mine, and I think you're neat and am enjoying following your journal. And the image of you galloping around in gym class is way too precious :).